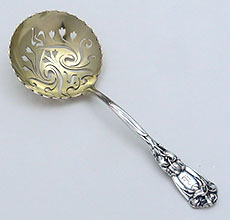 A Durgin Iris pattern pierced art nouveau sterling silver pea server with a large circular gold washed bowl. 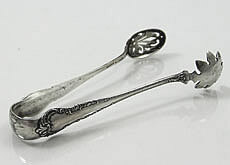 Length 8 1/2"
Seven Durgin sterling silver strawberry forks with chased strawberries on the handle extending into the bowl. Length 3 1/2". 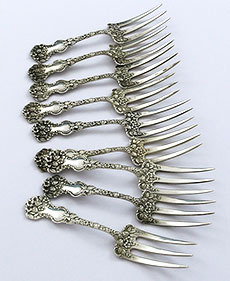 All forks are monogrammed lightly with a C on the back of the handles. 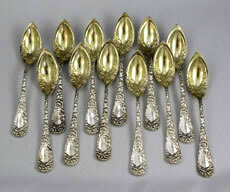 D2077 Durgin Grapefruit Spoons 5 7/8"
Set of twelve Durgin Chrysanthemum grapefruit spoons with a S monogram in the cartouche. Gold washed bowls. Length 5 7/8".